The heads of 30 schools across London have welcomed the introduction of the Ultra-low Emission Zone (ULEZ) coming into force today and called on Sadiq Khan for further action to tackle the threat of air pollution. 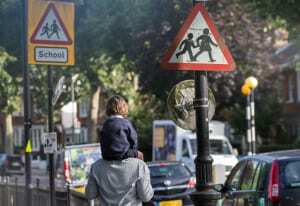 In a strongly-worded letter to the London Mayor, headteachers have expressed their concerns about the growing number of scientific studies revealing the serious health damage air pollution can do to children’s health, from stunting lung development to causing asthma. The letter, coordinated by Greenpeace, comes amidst growing public concern for the impact of traffic fumes on pupils. Public Health England has proposed a ban on cars idling outside school gates as part of a series of measures to cut air pollution, while nearly two-thirds of teachers across the UK would support car-free roads outside schools during drop-off and pick-up time. In 2017, a joint investigation by Unearthed, Greenpeace’s investigative unit, and the Guardian showed hundreds of thousands of UK school and nursery children could be exposed to illegal levels of toxic fumes, with many of them in London. “The ULEZ will be one of those things our children look back at and think “why didn’t you do that sooner?”. It’s hard to sincerely question the positive impacts of a move that will cut toxic pollution at hundreds of our schools and in some of London’s most deprived communities.